One of things I miss about working in Koreatown is lunch. From Crenshaw to Vermont, from Beverly south to Pico, Ktown is one of America’s great food courts. It was never a tough sell to convince my noontime appointments to drive to meet me near my office, where I could expose them to what was often their first taste of BBQ short ribs, bibimbap, braised cod on daikon, or grilled smoked duck with a ginseng root chaser. For years, Ktown dining was the inverse of Westside. There was just one café with avocado toast, but a half dozen with pumpkin porridge. That’s begun to change. On the one hand, Ktown has been discovered. The Metrorail, Anthony Bourdain’s visits, Roy Choi, Yelp and gentrification have all driven Westsiders to Ktown. At the same time, Korean-American chefs have transported Korean dishes and ingredients beyond Ktown. Politicians may love borders. Food hates them. The latest example is Makani on Rose Avenue in Venice. Korean-American chef Kevin Lee is bringing Korean ingredients and dishes to a mostly non-Korean clientele. 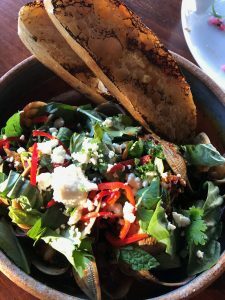 In the familiar ambience of an upscale beachside restaurant, he packs a menu with what is likely unfamiliar: dallae, nurungji, ssamsang and, in a couple dishes, enough of the Korean fermented red chili paste gochujong to make sure diners know Korea is in the house. “You said it was spicy, but I can’t even eat this,” a woman complained to her server about her eggplant with the puffed rice chip crackers called nurungji. Like a lot of dishes at Makani, its chili heat came fragrant with herbs, in this case basil and mint. Spicy? Not by Ktown standards. Delicious? Yes, by any standards. That eggplant shows what Lee does best at Makani: He pushes the new and the familiar all at once. The mung bean jeon are a good example of that. The chef soaks the beans overnight, blends them with green onion, kimchi and guanciale, forms them into two dollar-size pancakes, and fries them crisp. The accompanying aioli is made with gochujong and dallae, or Korean mountain chive: more heat and herbs. The result may taste exotic but also recognizable: these are the best new latkes on the Westside. The Westside’s newest latkes? 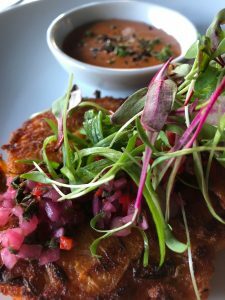 Makani’s Mung bean jeon with dallae aioli. Fresh herbs reappear piled high on the whole grilled branzino. Thai basil, perilla, cilantro, are all sharpened with pickled okra and fresh lemon. Fish lovers may be doomed to eat the bland, farm-raised branzino in penance for gobbling up the wild fisheries, but at least Lee freshens it up. Not all the blends involve Korean ingredients, but all of them play Asian, Latin American and European ingredients and techniques off each other. Romanesco cauliflower is roasted crisp, then tossed with kombu, aji amarillo pepper, yuzu, basil and spiced pistachios. The heirloom peach and tomato salad has French feta and lemon soy vinaigrette. These are the small plates, and by the time the sweet, hot, herbal and fermented flavors have all registered, the dishes have, sadly, gone. Steamed Manila clams come in a more generous pile. They are stacked atop a clam liquor gochujong-spiked broth, tossed with Chinese black beans and topped with a tangle of fresh herbs. Crumbles of French feta amplify the funk of the Chinese black beans. It sounds unconvincing, but with a bitter local I.P.A., I was convinced. Another main dish, the crispy duck confit, attempted the same East-West blend. Half a duck in the classic French preparation sat atop rice fried with bacon and kimchi, along with the Italian green spigarello and a dusting of furikake, the Japanese condiment of sesame, seaweed and (usually) MSG. When the server suggested we shred the duck and mix it into the rice, I resisted. For $38, I wanted to taste duck, not rice. Maybe I was wrong. It was dry, and after so many powerful, herbal, well-spiced dishes, bland. I couldn’t help think of one of my go-to lunch places in Ktown, Dha Rae Ok, just across from the original El Cholo on Western Ave. There, about $38 per person buys you an array of banchan and a platter of smoked duck slices that you cook yourself at the tabletop grill. At the end of the meal, the server removes the grill and adds the duck fat and crisped leftover bits of meat to a duck broth swimming with fat, white noodles. Once, on the way out, I asked for a shot of ginseng elixir from a glass tank with a massive gnarled root floating inside. To my Westside tongue, it tasted like a laundry hamper smells, but, yeah, it was authentic. The confit made me yearn for its Ktown cousin, but come on, there are some big advantages to innovation. Makani’s “Social Hour,” for one, that features $6 appetizers, and discounted selection of a rum- and mezcal-heavy cocktail list. By 5 pm on a Sunday, the place was packed with happy groups ordering flaming Tiki bowls and over-talking a Frankie Stew and Harvey Gunn mix. At Dha Rae Ok, ambiance is a TV screen set perpetually to Korean golf. Desserts go even more west, maybe because Lee understands there’s only so much change a palate can handle, especially when it comes to sweets. If the new spices and unfamiliar herbs left you traumatized, the solution is the olive oil cake with pistachios and cool, sweet mascarpone. Chef Lee seems to understand that it’s the same with restaurants. Customers want familiar flavors, and they want to be taken to someplace new and unexpected as well. Lee mostly pulls this off, and he does it the good old American way: by embracing what comes in from over the border, or, in this case, from just across town. Dha Rae Ok. 1108 S Western Ave. (at 11th St.) Los Angeles 90006. Facebook. I ate at Makani twice and tried 6 dishes. For more about my reviews click here. To get them delivered, please subscribe. 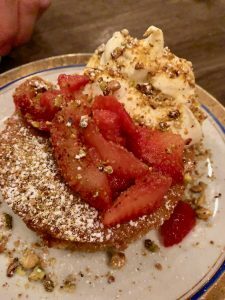 Makani’s olive oil cake with mascarpone.